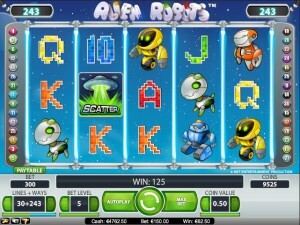 Alien Robots is a 5 reel, 3 row, 30 line online slot game. With that many lines, you can play at different bet levels or play all 30 lines with a whopping 243 bet ways to win up to 50,000 coins. Play on auto-play with 10, 25, 50, or 75 spins each or manually choose your bet levels as you see fit. Wild symbols dish out Free spins to win more coins and game rules can be found on The bottom left hand under The "?" tab. 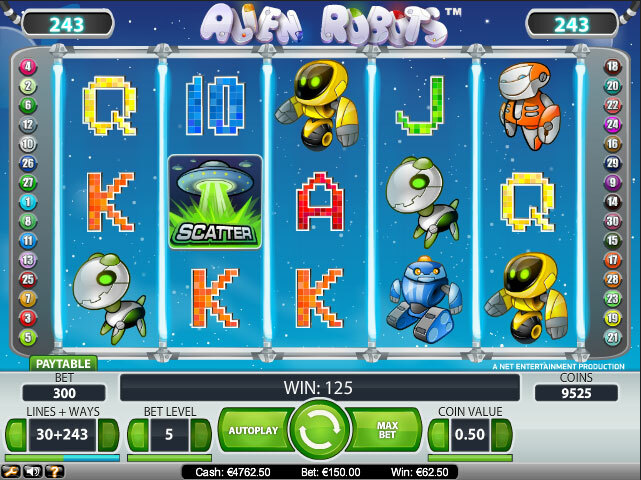 Alien Robots is straight-forward and easy enough to play as an amateur or novice slot player than can be played for fun or for real cash. Scatter symbols- activate Free spins when 3 or more show up on The reels in The main game. 3 scatters give you 10 Free spins, 4 give you 20, and 5 give you 50. If 3 or more scatter symbols appear in free spin mode, additional free spins are awarded. They can appear on any reel at any time during the main game. Wild cards- increase winnings In main game and expand In Free spins mode. Each Wild card represents every symbol aside from Scatter symbols. In both The main and Free spin games, Wild cards appear on reels 2,3, and 4. Sticky wilds- only available to appear in free spins mode. During free spins, wild symbols on the bet lines activate sticky wilds. They expand to cover the entire reel while the other reels re-spin for a chance to win a larger amount. After one re-spin, sticky wilds revert to standard wild cards. Set the preferred bet, bet lines, and game level before hitting the spin button (middle green button). View the coin/cash specifics at the bottom on the game located on the black panel. The Paytable, which gives all information on reel characters, winning combinations, and winning amounts, can be viewed anytime and is located above the bet button. The fun play mode may not express every feature. Join the world of fantasies with Orc vs Elf slot! December 17, 2015, No Comments on Join the world of fantasies with Orc vs Elf slot!